New runners will often feel frustrated when they find themselves getting winded soon after starting a run. While some people will tell you that you're simply out of shape, more often than not it's not your fitness level at issue; it's the speed at which you are running and the way you are running. As important as it is to start working out, you will get far more out of a run if you learn proper running form and technique. Equally important is how you prepare for a run, including the foods you eat and the amount of time you spend warming up. Running requires an ample supply of fuel in the form of glycogen. Glycogen is the stored form of glucose (sugar) which our body warehouses in muscles and liver for future use. The moment you start a strenuous activity, such as running, your body will convert glycogen back into glucose to use as fuel. If you have too little in your body, you will burn out quickly. This is true even if you are in relatively good shape. Carbohydrates are the body's main source of glucose and glycogen. To build your glycogen stores before a run, eat a carb-heavy meal two to three hours beforehand (such as pasta, rice, or a whole wheat bagel with cream cheese). You can also top up an hour beforehand with a protein bar, some crackers, or a carbohydrate-rich sports drink. Another key tip is to take the time to stretch before a run. If you run cold, you will not only expend a lot more energy, you'll be at greater risk of injury. Aim for no less than 10 to 15 minutes of stretching, focusing as much on your upper body as the body and back. To avoid getting winded during a run, you need to do what the pros do and check your form, control your breathing, and pace yourself. Check your posture. Always hold your torso upright and avoid bending at the waist while running. This will help you breathe more efficiently by preventing the compression of your diaphragm. Slumping or hunching decreases your lung capacity while increasing your breathing rate. Control your breath. While running, breathe from your belly as opposed to your chest, using your diaphragm to completely fill and empty the lungs. Belly breathing gives your lungs much more room to expand and helps avoid side stitches that can develop when you breathe too quickly. Use your arms correctly. 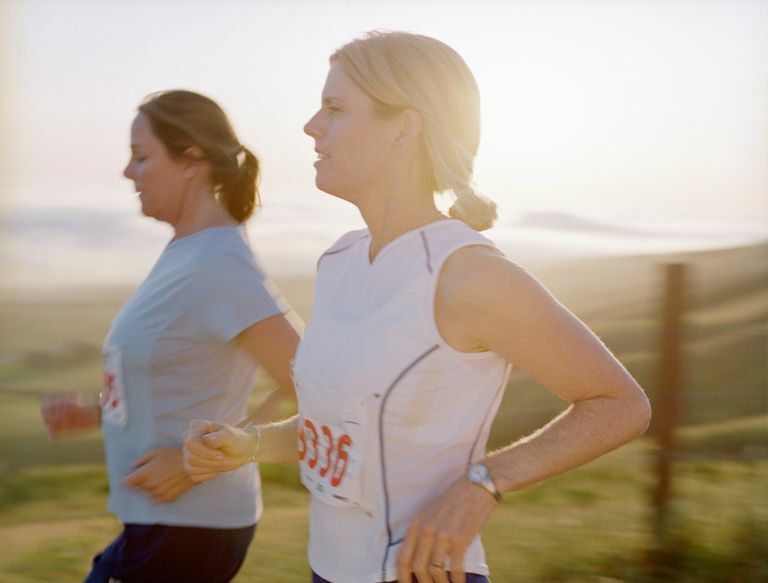 Always keep your arms at a 90-degree angle while running, rotating from the shoulders without swaying. As you pull one arm forward, pull the other one back. This rhythmic movement will help propel the body forward so that your legs don’t have to work as much. Inhale every three steps. As you run from left foot to right foot to left, count one, two, three. This is the rhythm you will use to direct your inhalations. Inhale deeply through your mouth and nose for the count of three, drawing your belly outward as you do. Exhale every two steps. Using your running pace as your guide, exhale completely and evenly on the count of two, drawing your belly in as you do. Focus on endurance rather than speed. Use your breathing as a guide. If you are able to run a certain distance without getting winded, you can gradually pick up the pace as long as you follow the same rules regarding form and breathing. Keep track of your heart rate. Your maximum heart rate (MHR) is the number you should not exceed when doing strenuous exercise. To estimate your MHR, simply subtract your age from 220. When first starting, keep to around 65 percent of MHR or lower. If you are able to run at this pace without getting winded, you can gradually increase until reach 85 percent of your MHR.